Over the next few weeks, some of you may see messages (like the one in the image above) while classifying on Galaxy Zoo. We are testing out a new messaging system. These messages should not appear frequently and, if you do see one, you will be able to opt-out of seeing any subsequent messages. In the unlikely event that you do see more than one of these messages during your classification session, you can let us know by emailing contact@zooniverse.org. UPDATE: The messaging experiment was ended in November 2017. To read about the results of the test and what we plan to do in the future, read this blog post https://blog.galaxyzoo.org/2018/07/12/galaxy-zoo-messaging-experiment-results/. 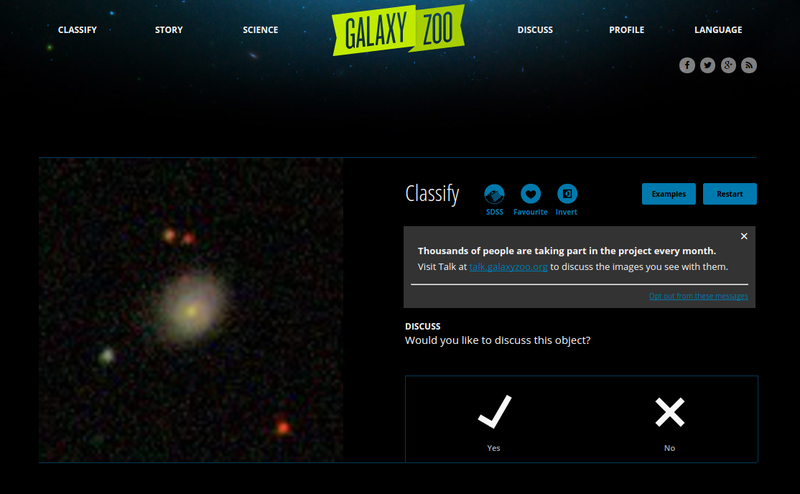 The initially stated aim of this experiment was to test a new messaging system on Galaxy Zoo. However, the actual aim also involved testing the content and timing of these messages in order to measure their effect on volunteer participation. The experiment was titled ‘Alleviating disengagement in Zooniverse‘ and was performed in collaboration with researchers at Ben Gurion University and Microsoft Research. Volunteers were not explicitly told the purpose of these messages at the time as this would have affected the experiment results. You can read more about our planned procedure for future similar experiments in this Zooniverse blog post https://blog.zooniverse.org/2018/07/25/experiments-on-the-zooniverse/. If you have any concerns or complaints about this study, please contact Grant Miller using the contact details above.